By Nicholas Rogers Coat of Arms no 127, Autumn 1983. It has long been accepted that the earliest occurrence of the three lions passant guardant of England is on the second great seal of Richard I, made in 1195 by William the goldsmith, but not brought into use until 1198. The first great seal, made on Richard’s accession in 1189, shows what, as Adrian Ailes has convincingly demonstrated, must be interpreted as a single lion rampant. Although no pictorial evidence survives, Henry II bore arms of some sort, for the chronicler Ernoul relates that a body of English troops at Jerusalem in 1187 were ordered to set the arms of the King of England — “les armes le roi d’Engletiere” — arms, and inclines to the view that Henry most probably bore two lions passant, although he accepts that Henry may have used more than one coat. 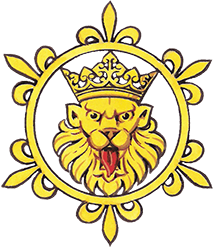 In this unruly period in the development of heraldry there was a considerable degree of variation in the use of a lion or lions by the various members of the Angevin dynasty. The earliest example is the famous “clipeus, leunculos aureos habens” which was hung round the neck of Geoffrey Plantagenet when he was knighted by Henry I in 1128. Henry II’s younger brother, William FitzEmpress, shows on his seal a single lion rampant, while King John, as Count of Mortain and Lord of Ireland, bore two lions passant between 1185 and 1199. William Longespee, the illegitimate son of Henry II, at first used a single lion, but then, perhaps feeling that such arms were too common, reverted to his grandfather’s; Azure six lioncels Or. It is reasonable to assume that a similar consideration motivated Richard I to change his arms. Ailes suggests that Richard chose three lions passant guardant because such arms, while resembling those of his father, would have differed noticeably from those used by his brother John. Alternatively, he may have adopted three lions passant guardant precisely because they were his father’s arms.